World Leadership Federation presented the Middle-East Asia Leadership Summit and Award. This event was a platform for leaders to meet leaders from different sectors, build their network, share and exchange experiences and ideas, discuss latest trends in leadership and most importantly, get recognized at the highest level. Highly anticipated event, powered by Collabera – a Global Staffing Giant, was held on 23rd February 2017. The honorable jury members selected the winners from 150+ categories from across the globe. 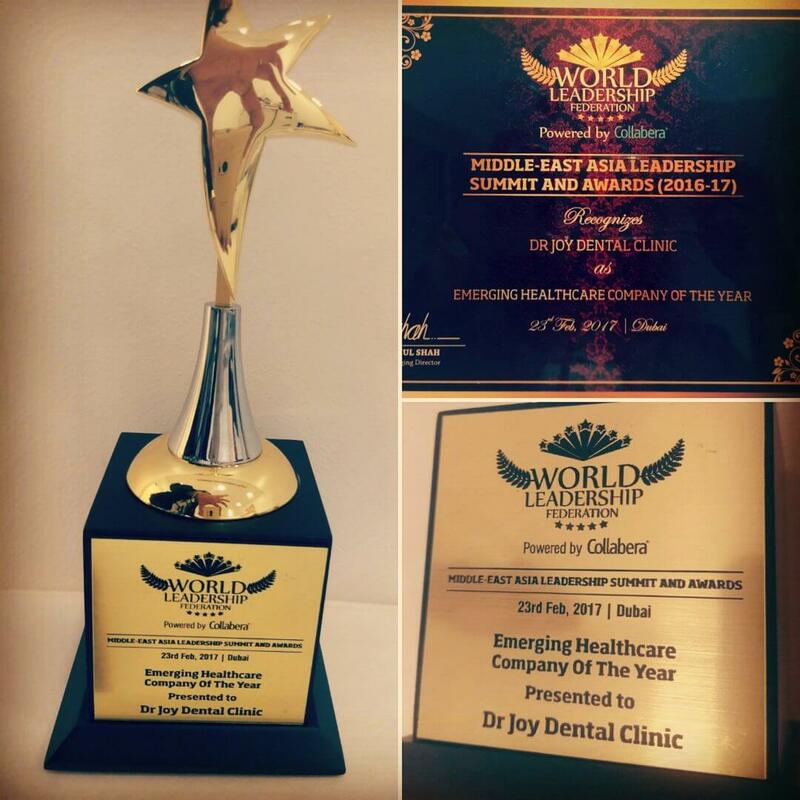 Dr. Joy Dental Clinics was honored with the “the emerging healthcare company of the year” based on the clinic’s unrivaled and consistent quality dental service. The event honored leaders for their outstanding contribution towards the growth in economic, educational, social and leadership development. This event also presented an opportunity for leaders to learn about the latest worldwide leadership trends and discuss about the same at a common forum. World Leadership Federation is a global platform which brings leaders from different industries together at a common stage. In doing so it creates a unique opportunity for the leaders to share their success stories, their perspective about leadership, share and discuss new ideas which will help the next generation of leaders. World Leadership Federation is dedicated towards identifying the best leaders across various domains and ensures that they inspire the next generation of leaders. World Leadership Federation events have emerged as one of the best series of leadership events in the world when it comes to recognizing leaders and celebrate leadership. In a short span of time it has carved its own niche. The value World Leadership Federation adds makes the corporates and leaders feel proud in being associated with it.